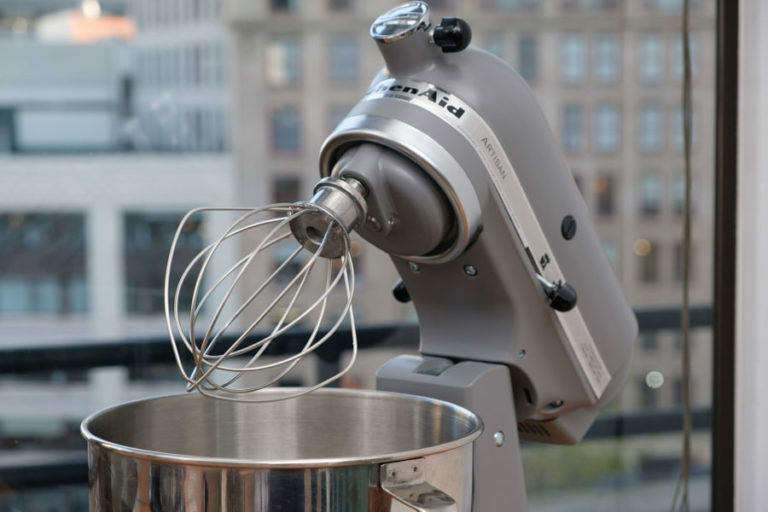 The best stand mixer saves you time in the kitchen by whipping, mixing, and kneading while you attend to other things. It’s powerful and versatile enough to handle a variety of tasks, and it mixes everything in the bowl quickly and thoroughly. We studied electric stand mixer construction and spoke with a professional baker about necessary features, then tested recipes in 12 mixers to find the best. 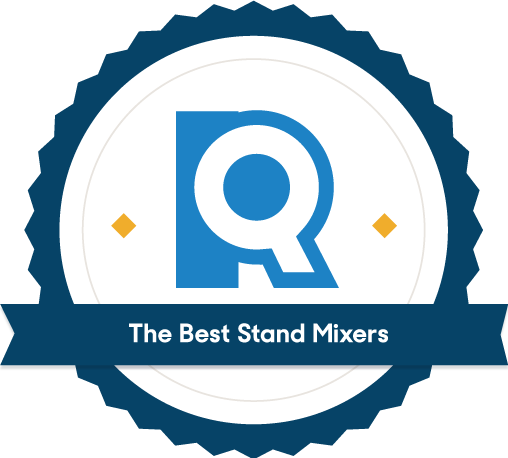 The truth is, stats don’t correlate to quality for stand mixers. What a stand mixer can accomplish depends on the efficiency of its motor, how much torque it exerts, and how well aligned its bowl and attachments are — things you won’t see printed on the box because they can’t be measured. To get a feel for those “immeasurable” qualities, we researched stand mixer construction and spoke to a professional baker about her non-negotiable mixer requirements, then brought in 12 promising models to test ourselves. 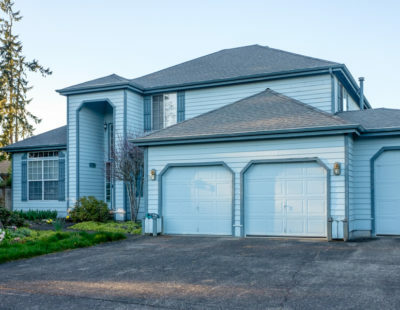 Professionals agree that 4.5 to 5.5 quarts is a good size for home use. This is enough capacity to mix a couple of batches of cookies, knead a loaf or two of bread, or throw together a birthday cake. 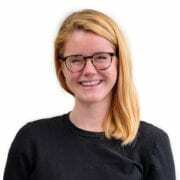 Tish Boyle, editor of Dessert Professional Magazine, told us that even when making big batches for recipe development and testing, she says “there were very few times that capacity was a problem.” Larger mixers actually give you more space than you’ll probably need and can limit your mixer’s ability. For example, with small batches, their attachments don’t come as close to the sides of the bowl, leaving some ingredients untouched. That 6-quart mixer will leave you high and dry when it comes to whipping a few egg whites into peaks for meringue or angel food cake. The 6-quart KitchenAid (left) couldn't reach two egg whites, while the 5-quart model (right) engaged them fully. Most 4.5 to 5.5 quart mixers will be tilt-head models. As their name suggests, tilt-head mixers have a head that you tilt backwards for access to the bowl and mixing attachments. They’re best for home use because they’re smaller, lighter, and less noisy than the other type of mixer, bowl-lift. The other important thing to look for is planetary mixing action. Planetary mixers use a single beater that travels around the bowl in one direction, while spinning on its axis the opposite way. According to Cook’s Illustrated, planetary movement ensures that “the mixing attachment interacts with the entire contents of the bowl.” Maximum contact with ingredients allows for even mixing and reduces the time you spend stirring by hand to get everything incorporated. Tilt-head mixers aren’t cut out for big-batch kneading, but they still need to be strong enough for occasional hard jobs. To assess the motor strength of our mixers, we used America’s Test Kitchen’s recipe for Pizza Dough Kneaded in a Stand Mixer. We substituted in whole wheat flour to make the dough extra tough. In order for a stand mixer to knead well, its motor must use a winning combination of power and torque -- without adequate torque, dough can either get stuck in one place or end up wrapped around the dough hook (called “hook climbing”). We went small for our next test, beating just two egg whites. The goal was to see which attachments were aligned well enough to engage every part of the bowl. We weren’t just looking for the strongest mixer, after all, but one that would also excel at even the most delicate tasks. The best stand mixers whipped egg whites quickly, without leaving any liquid untouched. Mixers with poorly designed attachments, like the Bodum, couldn’t reach all the ingredients in the bowl. We put our three remaining mixers up to one final test: mixing a perfect batch of cookie dough. The best stand mixer should be able to engage every ingredient without too much help, so we looked for lots of touch points — the number of places where the attachment comes into close contact with the bowl. The more touch points a mixer has, the less time you’ll have to spend scraping and stirring by hand. None of our mixers were flawless in this round, but we didn’t really expect them to be. Tish Boyle says that you’ll end up scraping by hand with pretty much any stand mixer — she has yet to find one that does the job perfectly all on its own. The KitchenAid Artisan stand mixer is powerful, efficient, and versatile. It’s the gold standard for good reason. In testing, we loved the way it churned out springy pizza dough, stiff egg whites, and creamy cookie dough — usually in about half the time of our other mixers. At only 375 watts (the highest we tested was 750), it had no trouble kneading tough dough. This is because KitchenAid has really mastered that elusive idea of “torque,” pulling the most efficiency out of its motor. The mixer worked the dough all around the bowl without any pesky hook-climbing. Even in the stickiest of spots, the Artisan never shuddered, stalled, or ground its gears. The Artisan performed better than any other mixer we tested, thanks to the combination of a strong motor and well-fitting attachments. Beyond sheer mixing abilities, the Artisan’s thoughtful design and excellent components reflect the almost 100 years of development that KitchenAid has put into this product. The bowl is lightweight and easy to handle, the controls are intuitive, and the latch to tilt the head is located on the side for easy access. Other top contenders position tilt latches on the back of the head, which forces you to reach blindly. The Artisan’s head is also narrower than other mixers, allowing us to add ingredients with the head down and mixer in motion. Finally, the Artisan comes in almost any color you could wish for. Since most people end up keeping their stand mixer on the counter, a design that’s both functional and attractive is important. We also love the wide range of attachments that you can add to any KitchenAid mixer, taking it from a simple baking tool to an indispensable kitchen appliance, capable of preparing anything from ravioli and ice cream to ground meat. The wire whisk and flat beater fit the bowl perfectly, saving time with their efficient function. The Artisan’s slip-on splash guard is a breeze to attach and take off. Other contenders either didn’t have splash guards (and consequently flung ingredients out of the bowl) or came with multi-piece guards that we had to put on in stages. One of the biggest benefits of owning a stand mixer is that it saves you time in the kitchen. KitchenAid elevates time-saving to an art. The KitchenAid's pouring shield slips on easily and keeps ingredients in the mixer. At over $400, this mixer is a big investment. But it’s one that will pay off in the long run by simplifying all of your kitchen work now and for years to come. KitchenAids are built to last. 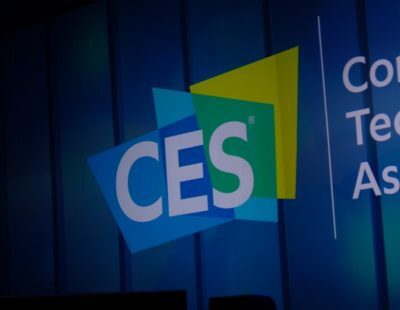 Plus, you can usually find it cheaper on Amazon or on sale in retail stores. While not quite as powerful as the KitchenAid stand mixer, it’ll do a great job in the kitchen and save you some money. For a stand mixer that performs nearly as well as the KitchenAid Artisan but for almost half the cost, we were impressed with the Cuisinart Precision Master stand mixer. This stand mixer really held its own in testing; It handled pizza dough nicely, had great bowl coverage, and made a mean batch of cookie dough. It takes a little longer to complete tasks than the Artisan does, and it requires a little more attentiveness on your part. But if speed isn’t your primary concern, this may be the mixer for you. Like KitchenAid, Cuisinart includes an attachment port to expand your mixer’s arsenal. It doesn’t offer KitchenAid’s 10+ attachments, but the four in its repertoire are plenty to accomplish all major mixing feats. The relationship between its attachments and the bowl made Cuisinart a surprise favorite in testing. Its flat beater did the best job of pulling batter away from the sides and bringing it towards the middle. We only had to give it one good scrape to make sure everything was evenly mixed. Its whisk also made lovely, fluffy egg whites. The Cuisinart's flat beater pulled dough away from the sides of the bowl. The Cuisinart’s 500-watt motor was more than powerful enough to handle our stress test. It never stuck or stalled while kneading, and it was noticeably quieter than most other models. The dough climbed up its hook a bit, forcing us to take the ball off the hook a couple of times and place it back in the bowl to re-engage. But once we did, this mixer did a great job kneading. When it comes to this reasonably priced mixer, the tradeoff is a classic one. You get an infinitely more attractive price tag, but you won’t find the same convenience or power. For stand mixers, that translates to speed. The Cuisinart is simply slower than the Artisan and it struggled more with kneading heavy dough. But for almost $200 less, we’re okay waiting a few extra minutes for the Cuisinart to do its job. A hard-working, well-designed, retro stand mixer that comes close to matching the KitchenAid's performance. If your stand mixer’s style is a priority on par with its strength, we recommend the Smeg 50's Retro Style. The Smeg stand mixer did a solid job in all of our tests — it’s a hard working, well-designed machine. But what we really love about this mixer, and the reason it made our final list, is its cool retro design. Like the midcentury’s dreams of outer space, this aerodynamic little beauty is sleek, optimistic, and fashion-forward. The Smeg passed every test we put it through. 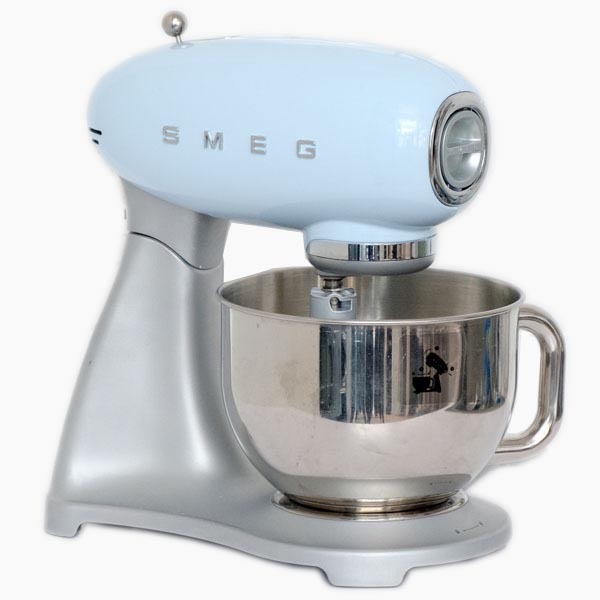 It creams butter and sugar beautifully, its kneading ability is akin to the Cuisinart’s, its egg-beating ability a little better, and when it came to cookie dough, Smeg’s mixer performed similarly to KitchenAid’s. It did a great job mixing everything together, though we had to scrape down the bowl quite a few times to re-incorporate ingredients. If you love the retro design, this mixer is another great alternative to KitchenAid. The one practical place Smeg roundly trounced the competition was in clean-up. All of its components are wonderfully nonstick. There was almost no residue left clinging to the inside of the bowl, and its attachments came out more or less free of food particles. The other mixers weren’t horrible to clean, but we did have to spend a little extra time scrubbing dried dough out of crevices. 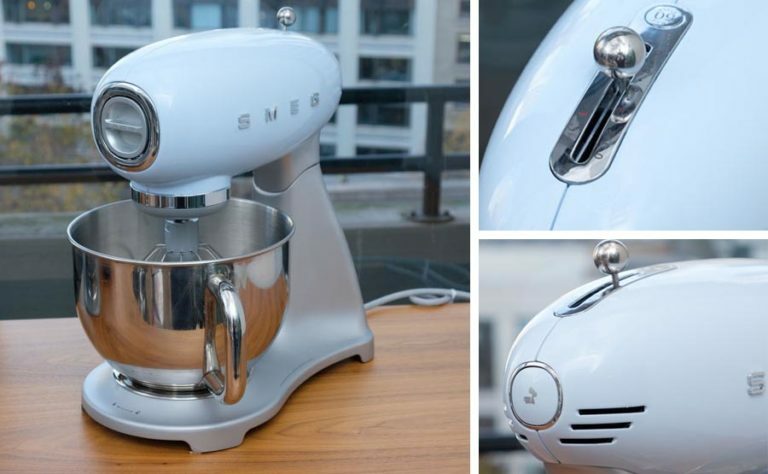 Smeg’s mixer is about the same price as the KitchenAid Artisan — nearly $500. If functionality is your top aim, the KitchenAid is our pick. And with the Artisan’s classic profile and roster of colors, you won’t be sacrificing on looks. 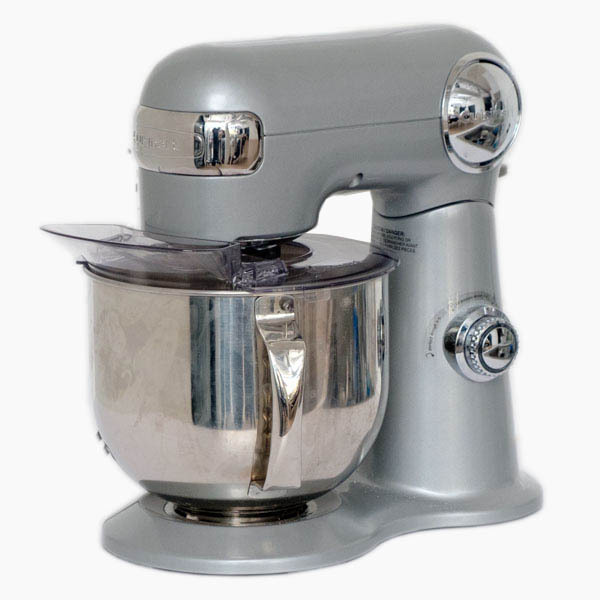 But if you absolutely love this retro look, this mixer is a great option. 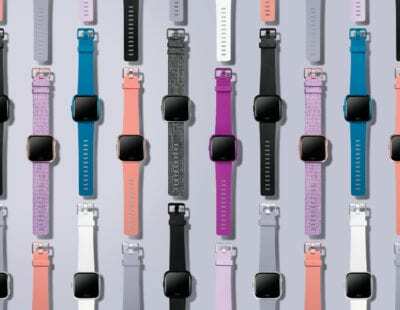 Plus, you may be able to find it on sale — we’ve seen it on Amazon for $300. One of Tish Boyle’s only complaints about her KitchenAid mixer was that its metal attachments aren’t dishwasher-safe. She points out that if you’re using it often, having to wash the attachments by hand every time can be frustrating. We suggest looking for a mixer with plastic- or nylon-coated attachments that you can toss in the dishwasher for easy cleanup. Only one of our top picks, the Cuisinart, comes with dishwasher-safe attachments, although the Smeg and Kitchenaid both did so well at repelling stuck-on dough that we didn’t really mind washing them by hand. We saw a lot of users wondering whether or not their stand mixers are fitted with all-metal gears, citing concerns that having some plastic gears can make for weaker or less durable mixers. 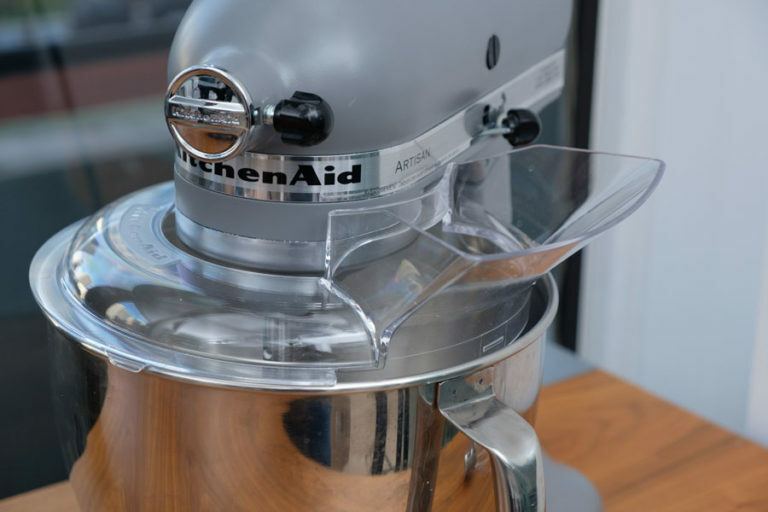 We spoke with a KitchenAid representative about this matter, and she explained to us that metal innards can be important for bigger, stronger mixers that will take on lots of tough jobs. For tilt-head mixers though, they’re not so crucial. Tilt-head mixers aren’t designed to take on jobs so stressful that their gears will break. If you’re doing serious bread making or other tough work, consider getting a bigger bowl-lift mixer with all-metal gears. With normal baking tasks, though, you don’t have too much to worry about with plastic gears. We focused on tilt-head mixers for this review. If you’re serious about making bread or other tough doughs, you’ll need a spiral dough hook, which can’t be used in tilt-head mixers because they exert strong upward force that could easily snap the tilt hinge. For tackling heavy-duty dough (and lots of it), we recommend looking at bowl-lift mixers. Bowl-lift mixers use a crank that raises the bowl up towards the mixing tool. The larger motors of bowl-lift mixers are only necessary if you do lots of heavy work, like kneading bread, pizza dough, and bagel dough. The best tilt-head mixers can handle an occasional batch or two of tough dough, and will excel at everything else for a much lower cost. What’s the best KitchenAid mixer? KitchenAid has been making stand mixers since 1919. That’s almost a hundred years to perfect stand mixing technology (and come up with fun new colors). As a result, KitchenAid products have become the standard in the industry. 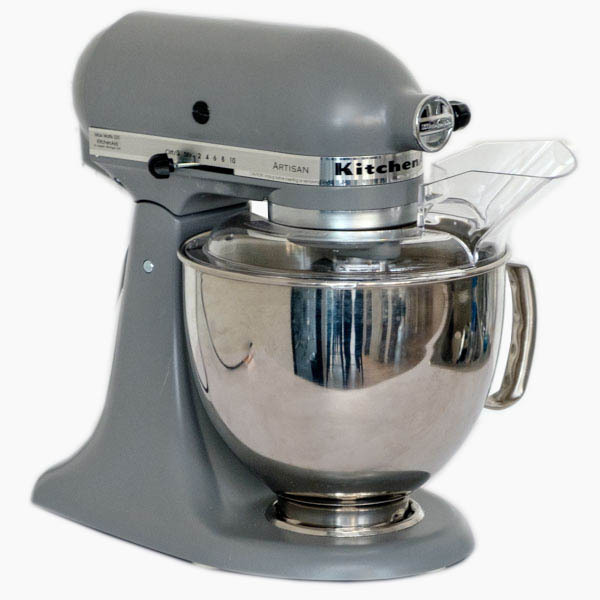 Any of the KitchenAid mixer models can accomplish kneading, blending, creaming, and whipping. The real differences are size, power, and price. The number of mixers KitchenAid offers may seem overwhelming at first, but for most people the choice will really be between four models: the Classic, the Artisan, the Pro 600, and the Professional 6500 series. KitchenAid mixer reviews surface plenty to love about each one. We landed on the Artisan as the best for most kitchens because it has the power to knead a loaf of bread, while being small enough to fit comfortably on the counter. With an ideal capacity, tons of clever attachments, and robust functionality, the Artisan is the best-selling KitchenAid mixer and we can see why. Will new attachments fit old KitchenAid mixers? One of the benefits of owning a KitchenAid is that they make a lot of really cool add-ons for their stand mixers. The mixers and attachments have both changed and improved over the years. However, KitchenAid has kept the power hub consistent. This means that even if you have a 30-year-old KitchenAid mixer handed down from your mom’s wedding registry, you can buy the brand new ravioli maker attachment you want and it’ll fit right in. What if the bowl and attachments aren’t aligned? A mixer’s bowl and attachments may not be calibrated exactly right the first time. Luckily there’s a fix for this. Most mixers have a screw that can be used to raise and lower the attachments, bringing them into closer alignment with the bowl. By doing so, you improve the attachment-bowl relationship and ensure that no ingredients are getting left behind. On a tilt-head, you can find the screw just under the head when it’s tilted upwards. On a bowl-lift, it’s on the stem a couple of inches below the head. You can test all the recipes you want, but your equipment doesn’t need to be one of the variables. We’ve leveraged the best kitchen equipment experiments out there, talked to the gastronomic experts, and tried out the most promising products ourselves. We dish up our findings in the reviews below.